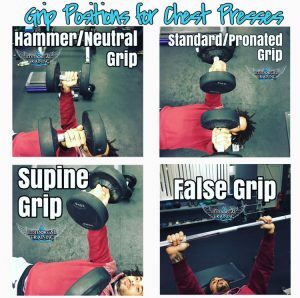 It is important to work every muscle from every possible angle, so here’s some insight into the grip positions for chest pressing exercises. This is the most common hand position for chest presses. The depth that it allows you to reach enables you to stretch the pectoral muscles more at the bottom part of the movement. It should be noted that flyes are usually the best choice for range or motion when training chest. Pectorals Minor is a tiny muscle that lives in the middle of the major pecs. It’s main purpose is to stabilise the scaplae during pressing movements. The hammer grip will put more emphasis on this, but will still involve major pecs a great deal. The increased stabilisation of the shoulder means more emphasis on chest. You would think that this would mean that you could push more weight in this position. Unfortunately that is not the case! Shoulders play a big part in pressing, so if you’re looking to go heavier try the false grip (below). All around the best choice for upper pectorals. Even on a flat bench upper pecs will still be forced to work harder. I also strongly recommend this press if you are looking to build size in the triceps. Supine grip will make the inner head of tris work harder and this is the biggest muscle in the arms! It’s AKA suicide grip because it is considered to be the most dangerous. Although in my 15+ years of training I have never seen anything go wrong with myself, or anyone else, when using the false/suicide grip approach. The grip allows you to keep your elbows under the bar and takes strain off of the hands and wrists. Imagine that you don’t have hands and that you are pressing the bar using the bottoms of your radius and ulna bones (forearm bones). Wrap your palms, fingers and thumbs around the same side of the bar and use a spotter. You can push the most weight when using this technique.